Mom loves it. She is cold natured and she loves the way she can put arms through it and get up to go refill coffee or to the door. She's happy so I am. Quality product for a low price. I definitely will recommend it for anyone else who might be looking for a low price gift for birthday or Christmas. Not made cheap is what I was surprised about. Thanks for the great service and price for the quality of the product. Made of super-soft, lightweight, luxurious and snuggly fleece with oversized loose fitting sleeves, so shoulders, arms and upper body remain protected from the cold but arms and hands are free to use your laptop, TV remote, read a book, talk on the phone, eat a snack and much more. This blanket won't slip and slide like a regular blanket and allows complete freedom of movement. As the temperature drops, you can keep your heating bill low and stay warm and comfy with your blanket. Ideal for staying toasty warm at sporting events or chilly outdoor evenings. Love this blanket. It is warm and soft and very light. Does exactly what I expect it to do. 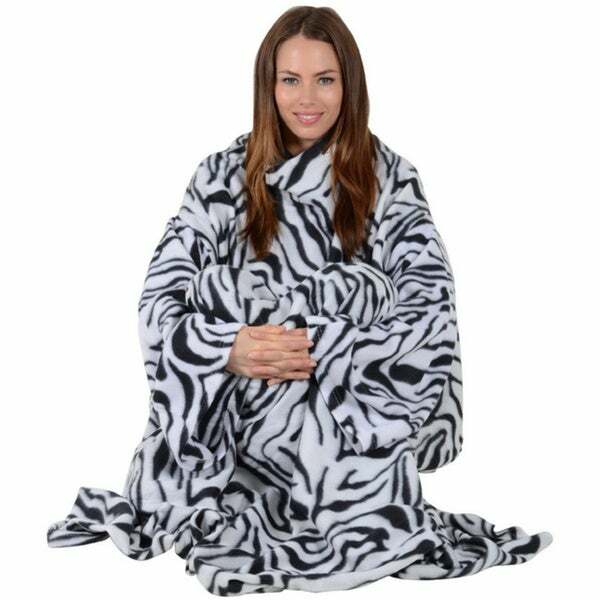 i've never had a snuggie but wanted to give it a try, and the leopard print of this is the perfect fit for my living room, so i went for it. this is not the highest quality fleece but it's good enough. i'm only 5' 4" so wasn't concerned about the length but it really could be a few inches longer to make sure my feet are covered. other than that, it's totally serviceable and a purchase i use every day. It is not what I was expecting. I thought it would be black and white and it was orange and white, and it wasn't as plush as it looks in the picture. I love these types of blankets! My children and I use them for cover and is great in air condition and cold weather. Awesome for when we're ill and need warmth, superb for guests. first i ordered blue and got black. its very thin nothing at all like the as seen on tv *** . it horrible, very flimsy, its like cheap felt...very disappointing. I'm embarrassed to give it has a gift. Felt like it was made and sewn really cheaply. Not impressed. Feels nice just a little thin. Keeps away.The chill. Price and reputation of Overstock.